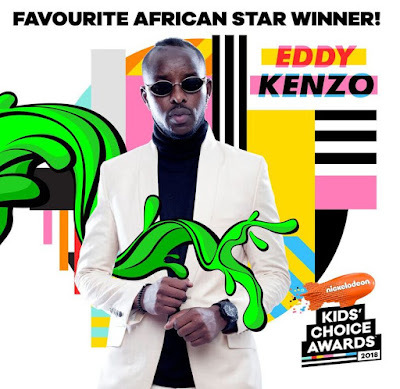 Africa - Eddy Kenzo has notched up yet another award: the multi-award winning Ugandan musician was named Favourite African Star at Nickelodeon's 2018 Kids’ Choice Awards! Eddy was announced the winner of the coveted orange blimp award, beating rapper Cassper Nyovest (South Africa), athlete Caster Semenya (South Africa), singer Davido (Nigeria), comedian Emmanuella (Nigeria), and singer Diamond Platnumz (Tanzania), as part of Nickelodeon Africa's local telecast of the 2018 Nickelodeon’s Kids' Choice Awards. KCA 2018, which, hosted by WWE Superstar John Cena for the second year in a row, took place at the “Fabulous” Forum in Inglewood, California on Saturday 24th March 2018, and premiered on Nickelodeon Africa and Nicktoons Africa on Sunday 25th March 2018 at 17:05 CAT, giving fans the chance to catch all the slime, music and mayhem of KCA 2018 less than 24 hours after the US live show. Eddy received the coveted blimp trophy thanks to kids throughout Africa who voted for their favourites online at kca.nickelodeonafrica.com and on Twitter using special #KCA hashtags. This becomes yet another big international award that Eddy Kenzo has won. The Ugandan superstar was the first winner of the BET International Viewers’ Award in 2015 and has won several others including AFRIMA Awards, Nigeria Entertainment Awards and the recent International Reggae and World Music Awards where he was named ‘Best African Entertainer’ among others. The award wining artist took to his Facebook page to show his gratitude on winning the award. Eddy joins Trevor Noah, South Africa’s most famous funnyman, who bagged the orange blimp for Favourite African Star during Nickelodeon's 2017 Kids’ Choice Awards last year. Viacom International Media Networks Africa (VIMN Africa) Executive Vice President and Managing Director, Alex Okosi, commented: "The Nickelodeon Kids' Choice Awards offer a platform for African stars to be recognised for their excellence in their various talents including, music, sport and television by kids all over the globe. We are delighted to feature the continent's highly talented nominees in the Favourite African Stars category [...]." Fans can find out more about Nickelodeon's 2018 Kids’ Choice Awards online at kca2018.tv and kidschoiceawards.com. Stay up to date on all Kids’ Choice Awards news by liking Nickelodeon on Facebook and following Nick on Twitter. Original source: allAfricanHits.com; Additional source: BellaNaija. Follow NickALive! on Twitter, Tumblr, Google+, via RSS, on Instagram, and/or Facebook for the latest Nickelodeon Africa and Kids' Choice Awards 2018 News and Highlights!